Get Married at the Star Trek Convention in Las Vegas! Just imagine you and your partner saying “I do” in an ultra-Trek setting! 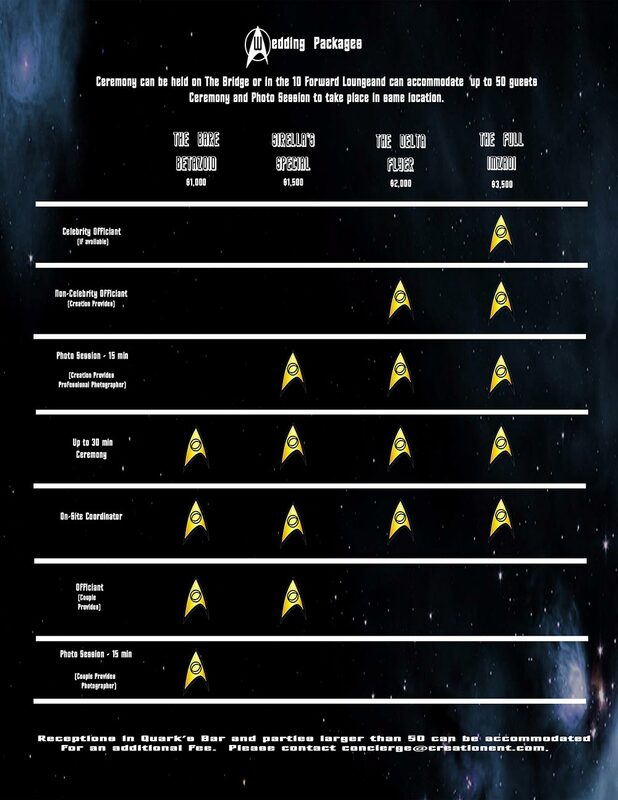 For the first time, Creation is offering special wedding packages for those Trekkers who want to “make it so” at the 2019 Star Trek Las Vegas Convention! With four different packages available, your special wedding ceremony can be held either on the amazing replicas of The Original Series’ Bridge or The Next Generation’s 10 Forward. Both sites can accommodate up to 50 guests! Ceremony and photo session will take place in the same location (either Bridge or 10 Forward Lounge) Parties larger than 50 can be accommodated in other areas of our convention space. Here are specifics about each of the great packages you can choose from! For an additional fee, receptions can be held at Quark’s Bar and parties larger than 50 people can be accommodated. Please email concierge@creationent.com for more information. May your marriages live long and prosper!